Bounds Green Ladies at The English National Finals this weekend. Congratulations on reaching the last 16 of The Ladies Fours. They go into action on Saturday 24th March at Melton Mowbray. A great achievement. Rhoda Young, Angela Frankland, Una Harman & Jo White. Lovely day here at Leamington Spa at the National Bowls Championships, Bounds Green (Nick Edwards, Geoff Lawrence and Andy Law) who make up the Middlesex A Team, in a great win against Essex, 16-10! The guys go through now to the next round, playing tomorrow at 9.30am. Congrats to them! Bowlers in EIBA National Finals. Congratulations to Lee Barber & Andy Law who have reached the last 16 in both the National Pairs & the National Family Pairs. A fantastic achievement. Congratulations to Colin Mason for reaching the last 16 of the National Over 60 Singles. 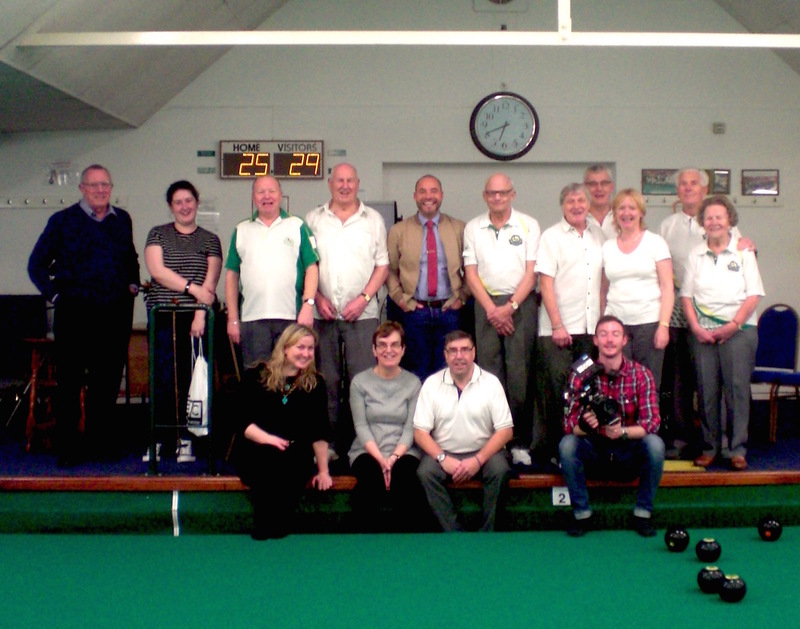 National Over 60 Singles, Nottingham April 14th. National Family Pairs, Nottingham, April 15th. Bowlers selected for Middlesex in Home Counties Semi Finals. Congratulations to: Lee Barber, Eddie Carnihan, Nick Edwards, Steve Griffiths, Andy Law, Geoff Lawrence, Les Massey. Colin Mason & Ray Young were also selected but have had to withdraw. The match is against Kent and will be played on March 26th at Doynings IBC in Surrey. 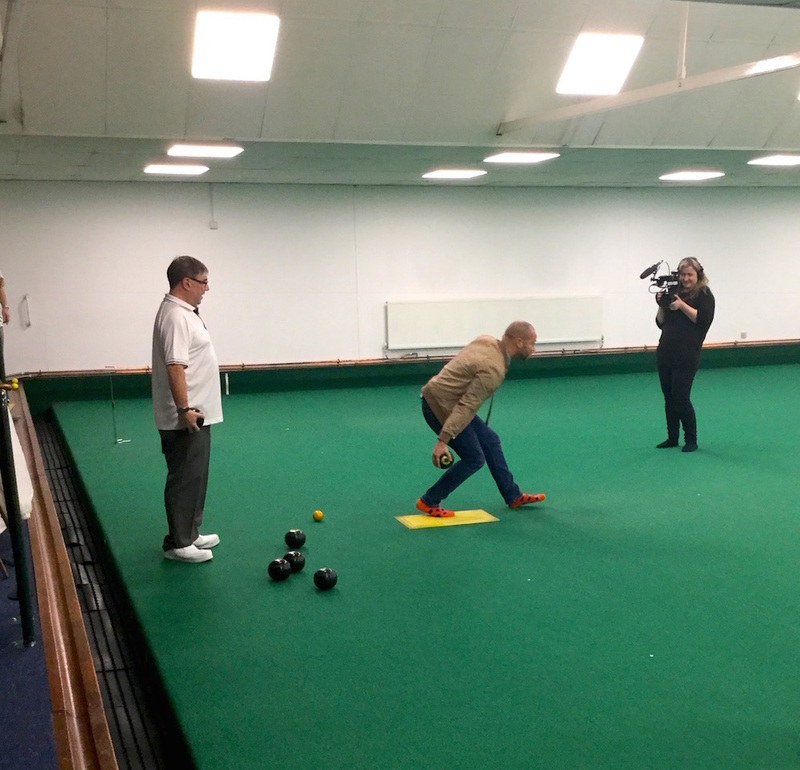 We welcomed a BBC crew to Bounds Green this afternoon, they were here to film some of our bowlers talking about their experiences with the drug Statins. It was for a programme called Health, Truth or Scare, which will be aired on BBC1, the series starts on the 27th April. They took lots of shots of feet, bowls and the bowlers doing their thing, then Kevin revealed his bright orange socks and had a go at bowling himself, with some top tips from Steve. He was a very promising beginner indeed! Then Bob, Margaret and John with two cameras and a bright light on them, and still managed to have a really natural conversation! They were excellent and and anyone voicing their opinions and sharing their experience of this very tricky but useful drug is doing a lot of people a big favour. 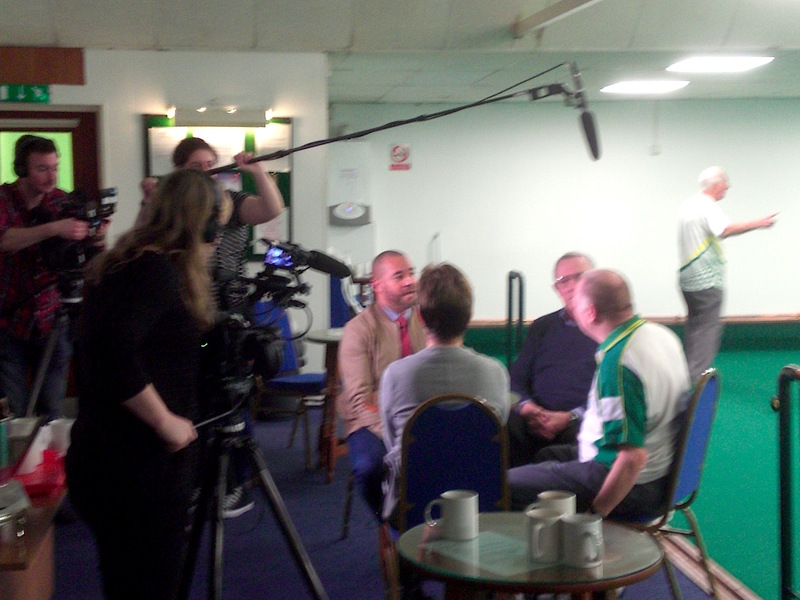 We will let you know when it’s aired, in the meantime thanks to all the bowlers for their great support this afternoon and to Kevin, Sarah, Greg and Katy for making it such a fun and interesting experience. World Champion at Bounds Green! Last night we had an epic match on our hands upstairs on the bowls green. We were playing a quarter final match in the Leonard Denny Memorial Cup against Huntingdon, exciting enough in itself, but when Nicky Brett (Current World Number 1, and World Indoor Bowls Champion) walked through the door, jaws dropped and loins had to be girded! For any tennis/social members reading, it’s a bit like Novak Djokovic pitching up to play for Our Lady of Muswell Hill Tennis Club. The match is in two halves, simultaneously playing at home and away at Huntingdon. Upstairs the game went towards Huntingdon early on when we dropped a six in the 4th end to go 11 – 2 down (yikes!) so we spent the rest of an edgy game playing catch up until in the penultimate end where we had fought back to 19 -18 up! In the final end Nicky Brett pulled out a great bowl to get shot and draw the game. A fantastic result for the team, Geoff Salter, Bob Anderson, Alan Harman and Nick Edwards, especially to keep their nerve in a tricky match and against a World Champ! But that’s only half the story, we had incoming messages throughout the game about the state of play in Huntingdon, where Eddie Carnihan, Alistair Frankland, Andy Law and Lee Barber had an equally tough challenge playing in unfamiliar territory after a two hour journey! Even though they were playing well, by the half way point they found themselves 17 -7 down. However with true Bounds Green never say die grit they battled back to draw 21-21, resulting in a nail-biting extra end to decide the fate of the match. …Back at Bounds Green we were all sitting in the bar nervously waiting for the result…could they pull it off?! After what seemed like an eternity, the call came – VICTORY! They won the deciding end. Thrilling evening, well done Bounds Green, and an absolute pleasure to meet and play against the World Champion and his team. We are now through to finals day at Cambridge Park IBC on the 24th April 2016. If anyone wants to come and support, talk to any of the bowlers. It’s been a long time since we last had a new gate – 1994 to be exact – but here it is. Thanks to Les & Nick for the construction. It has a shiny new keypad lock so no need for your key anymore. Just punch in the code. Code is available to members – just ask someone behind the bar.